Founded in 1994, muf architecture/art is a collaboration of artists, architects and urban designers based in London. muf has produced pioneering and innovative projects that address the social, spatial and economic infrastructures of the public realm. As specialists in public realm architecture and art, their philosophy is driven by an ambition to realise the potential pleasures that exist at the intersection between the lived and the built. 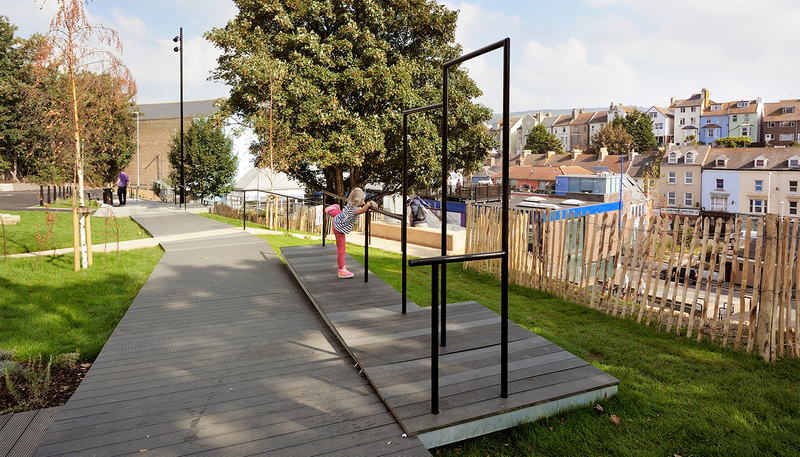 For Folkestone Triennial 2014, muf’s community participation-driven design rejuvenated an area known as Payers Park, which up to that time had been dilapidated and negatively perceived in the town. The extensive landscaping and redesign now offers an oasis of green space between the Creative Quarter, Grace Hill and Rendezvous Street, to be used by all sections of the community. muf worked with many different local groups to carefully design the area for ‘open’ use by a variety of users, creating a new social space and encouraging passage through the area. As a part of the design process, muf initiated an Open Air Museum event, working with local people and archaeologists on a dig, staged an open air bread and pizza oven, temporary tattoos by The Tattoo Shop and a program of live music, creating a platform to engage the many different constituents of the area. This was followed by a Relics Rap, weaving the archaeological report and the story of the previous occupation of the site with the personal stories of the young people who use it now, so demonstrating the tangible link between the past, the existing and the potential occupants of Payers Park.